Preparing for a panel discussion on Turkey gave me the opportunity of putting together some notes and slides on the country’s economy. That Turkey is not doing well at the moment, economically or politically, is well known. But the roots of the problem remain misunderstood. Many analysts blame the weakening of “structural reforms” (on economics) and the turn towards authoritarianism after the Gezi protests in 2013 (on the politics). See for example here. In truth, Turkey’s problems on both fronts predate the recent slowdown in growth and have been long ingrained in the governing party’s (AKP) strategy. I have discussed the politics before at length. Here I focus on the economics. Poverty rates and inequality have trended down under Erdogan, but again that is typical for this period for the middle income countries that serves as comparators for Turkey. In Latin America, for example, where inequality is high and endemic, the Gini coefficient has come down in virtually every country since the early 2000s. Again, nothing out of the ordinary about the Turkish experience. The comparative experience suggests that Turkey (and other similar countries) benefited from an unusually favorable external environment. In particular, financial globalization and the availability of cheap foreign capital seems to have played a critical role. So how has Turkey overcome this constraint over the last 12 years? By applying the same recipe of macroeconomic populism it has always relied on to generate growth – by borrowing, especially short-term, to sustain domestic consumption and investment. This strategy typically bears fruit as long as finance is cheap and available. But it comes at the cost of accumulating fragility and increased vulnerability to reversals in financial market sentiment. It often ends up in crisis as the funds dry up. The novelty under AKP is that the populist strategy was modified in two respects. First, there was much greater reliance on foreign capital inflows and less reliance on printing money. Second, there was a switch from public-sector to private-sector borrowing. The relationship is both statistically and quantitatively significant. An added 1 percentage point growth is associated with a 0.4% larger current account deficit (as a share of GDP). The downward shift after 2005 is of the order of 4.5% (of GDP). In other words, the growth-CAD tradeoff has worsened appreciably under the AKP government: at any level of growth, the current account deficit is larger by 4.5% (of GDP). This is a huge adverse shift, reflecting the lower domestic savings and AKP’s much larger reliance at the margin on external sources of finance. The AKP government was able to move the public sector into surplus (except for the crisis year of 2009), an achievement for which it receives great credit. But this improvement was more than offset by a substantial deterioration in the private sector balance. What has happened, in other words, is that the private sector has been encouraged, through easier access to credit, to go on a borrowing binge. Financial indiscipline and reckless have not disappeared; they have moved from the public to the private sector. In the 1980s and 1990s, there was a stream of thought – known as the Lawson doctrine -- that said we should not worry about external deficits that are the consequence of private sector saving and investment decisions. No serious economist believes this anymore in view of the systemic consequences of private sector folly. Private sector debt crises have a way of engulfing the entire economy, and largely as a consequence, unmanageable private debts tend to find their way onto the public balance sheet. The economic populism of the AKP government has become unmistakable of late. We see this in the shifting of the blame for negative outcomes onto external enemies (the “interest-rate lobby”), the sidelining of economically literate technocrats (A. Babacan versus Y. Bulut), the increased intolerance towards the rule of law, and the desire to subjugate policy instruments to centralized control (loss of independence of regulatory bodies, pressure on central bank). Rather than a fundamental shift in the government’s approach, we need to see these as the manifestations of the predictable failure of its long-standing strategy. 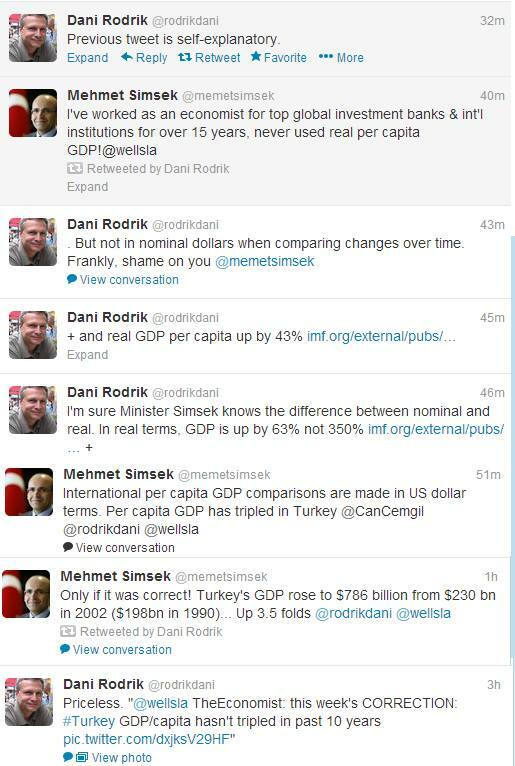 The bottom line is that the AKP government did not make any fundamental changes in economic strategy. It simply gave Turkey’s traditional macroeconomic populism a modern makeover, by relying more on foreign capital markets and by boosting private expenditures. Neither of these changes rendered Turkish growth healthier or more sustainable. What needs to be done? The preoccupation with “structural reforms” in Turkey is grounded in the view that macroeconomic reforms have largely taken root and now the time is to work on the supply side of the economy. This is an incomplete perspective, and it risks getting the priorities wrong. Macro reforms remain an unfinished agenda, especially on the saving front. What is required are policies that will tax credit and restrain short-term capital inflows while subsidizing household and corporate saving. The likelihood that such policies will be adopted now, in the midst of a significant economic slowdown and an election battle, is of course virtually non-existent. The flexibility of the exchange rate protects the economy from old-style currency rises (as in 1994 or 2001). But the road ahead will be a bumpy one for sure. For providing us the truth, thank you. Great post! I have a question regarding the declining inequality in Turkey. I wonder what the causes of that are. According to ILO data, Turkey's labour share has declined from 42.3% in 2003 to 29.7 in 2011. You are describing here the preferred economic policy practiced in many anglo-american culture economies since the 1980s. In the UK this was notably described by Colin Church and named by him suggestively "privatized keynesianism". There are then plenty of non-serious but extremely well compensated Economists still maintain that doctrine. It has even evolved into the Greenspan Doctrine that the best economic policy is to boost the balance sheets of property owners, so the capital gains may trickle down. A lot of people like the idea that they can make a lot of money by booming debt and then the public pays the bills. Among those many people the middle aged property owning middle classes in particular love that. There is myth is all economic markets, but this does not mean we can’t solve it, if we have determination to do something than we can do it. I am lucky that as a trader my performance has only grown with guide and support by OctaFX, it’s a brilliant company which has all the right tools especially their daily market update facility, it keeps helping me do correct trade and that is how I am always successful in this giant world of Forex.